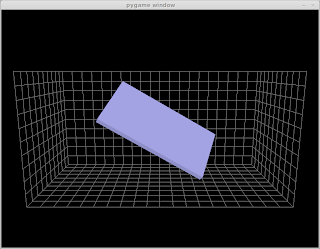 In this post I'll show how to serve the data over http and display a 3D representation in OpenGL extending on a previous blog post detailing how to read data from the MPU-6050 sensor and convert it into a something useful. Now point your browser at http://ip-address-of-your-pi:8080 and it will show a web page with the content of Hello, world!. We can make use of this to read data from a remote machine, in my case my Linux desktop. Connecting via your browser will now return the X & Y rotation values e.g. I'm using a Linux desktop and that is all I have tested this simple code on, I've no idea if it works on Windows or Macs and it certainly won't run on the Pi itself. I'm no OpenGL guru so this code is just hacked together to get something visible. Remember to change the URL line 038 to your specific value (the address you used earlier to test the server). When you run it a window will open showing the orientation of the sensor, rotating the sensor will update the display. You'll notice that when the sensor isn't being physically moved the noisy data is causing it to wobble. The next blog post shows how to reduce this. Excellent Work! Up and running on OSX with only few changes! Thankyou! Glad it worked ok. I'd be interested to see any changed / improvements you make to the code. I have corrected a bug in the render code and the server code so the orientations are calculated correctly. Unfortunately it won't run on the PI itself (as stated in the blog post), I ran the 3D code on my Linux machine. dayday, you can make it run on your RasPi alone. K, i will try this as soon as possible, thank you very much! Please check if you have pyopengl installed. sorry, I found sudo apt-get install python-opengl is better to install. Please check if it's available.